A Baldwin gets his name on a billboard! At the end of the summer camp season, Camp Summit split the camp into two teams, white and green and gave each team a theme. For the last few weeks of camp everything became a competition between the two sides – from sports events to stage performances, from clearing up to artwork. Leadership teams of four people were selected for each side and these leaders coordinated their team’s efforts. In 1995, I was asked to be a member of the white leadership team and for a European, this was a real and unexpected honour. Normally the colour war leadership teams were made up of Americans only (and to be fair, it was an honour for them too). I think that I got the gig because I was well organised and well known to the camp management – I was in and out of the office regularly, kept on top of the timetables, borrowed Mel Stern’s credit card from time to time and drove his vehicles off site too! 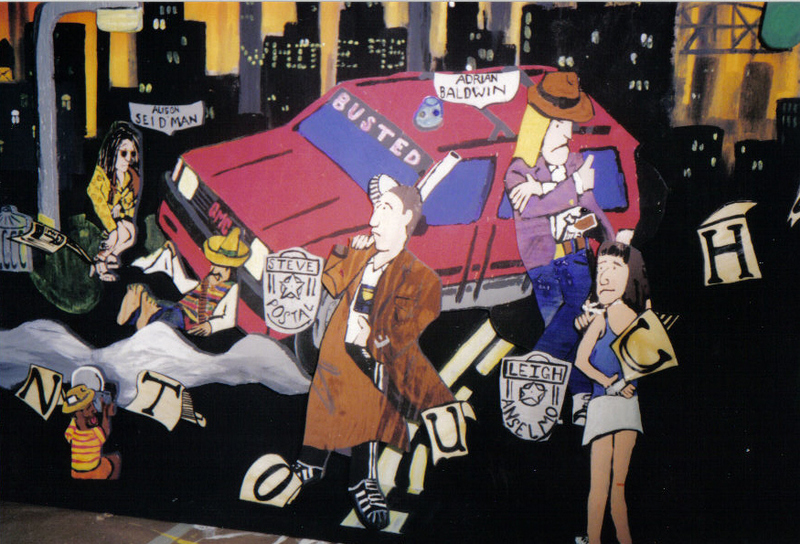 In 1995, the teams and themes were the Green Banditos versus the White Untouchables. 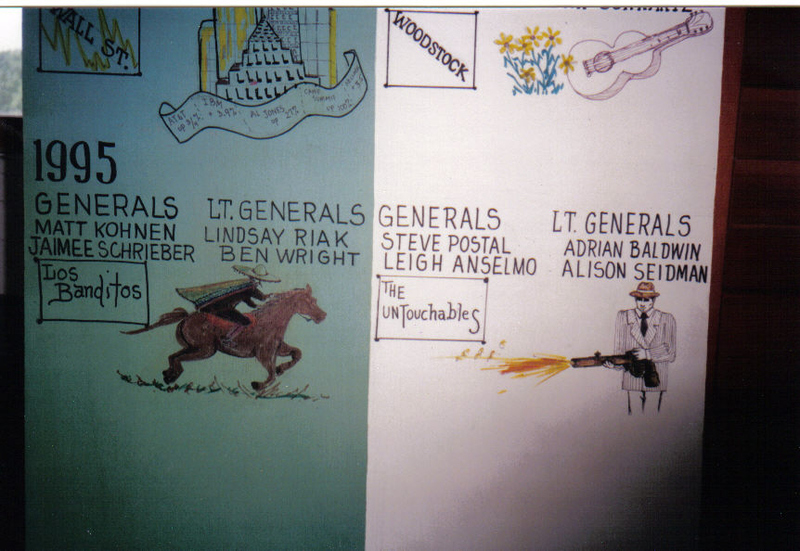 There is one particular memory from being a lieutenant-general that I’ll share with you. During a swimming competition it was necessary to field competitors to swim the butterfly for two lengths of the pool. Now to be fair the butterfly is a horrible stroke and I don’t understand why anyone selects the style over the front crawl. In the white team none of the kids were prepared to swim the heat and so I did it. I was rubbish, I came last by a significant margin and there was much jeering and piss taking (from my own side as well as the Greens)! Still we didn’t forfeit the event and you can hardly be a decent leader of anyone if you aren’t prepared to roll up your sleeves and pitch in. The most amazing thing about colour war for me was the art that used to get produced on camp. One of the coolest, most laid back, well-liked guys I ever met, a chap called Noah Kaplan, was a great artist. His work was amazing – in 1994 I watched him paint a huge picture of Jimi Hendrix on the floor of the camp gym. He couldn’t even see the overall picture without climbing up a step ladder and yet he knew where to put his brush. Each year a framed box was created at put on the wall in the gym – the White Untouchables box is pictured! 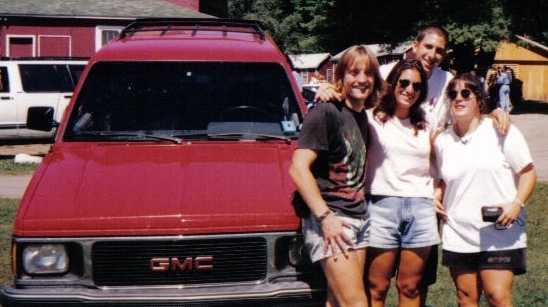 By the way in 1995 the white team won (nothing to do with my swimming)! I was pleased at the time and still take some pride in the result all these years later. *For any American readers, I know you’ll think that I have spelt ‘color’ wrong. In the UK it has a ‘u’ and I just can’t bring myself to use US English over UK English even when the context would be right.